Pressure on China has been escalating. 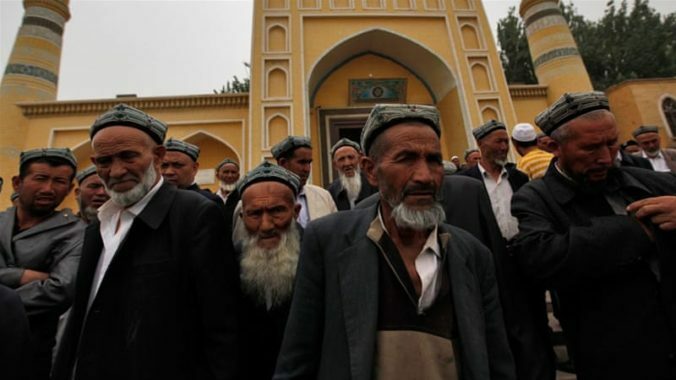 The UN has called China out over its treatment of the Uighurs. Media coverage has spread from a series of articles at The Atlantic to numerous outlets. And Congress has advanced the bills I mentioned, which would sanction the responsible Chinese officials, restrict the sale of US goods that could aid in the repression, and appoint a special State Department coordinator on the issue. Beyond that, Mike Pence mentioned the Uighurs’ situation in a speech earlier this year. This seems to fit with the Trump Administration’s prioritization of international religious freedom (IRF). Pence has argued international religious freedom is a priority for the Administration. Trump appointed Sam Brownback as ambassador-at-large for international religious freedom (a position that was vacant for much of Obama’s time in power). The Administration put a lot of effort into freeing a US pastor detained in Turkey and has pledged increased aid for Iraqi Christians suffering under ISIL. It also held a high-level Ministerial this summer to promote action among governments and NGOs around the world. Accordingly, the IRF community has taken a much gentler approach to Trump than they did with the Obama Administration. Many IRF advocates praised Brownback’s appointment, as the post was filled with someone they saw as dedicated to the cause. Trump also received praise for the Ministerial, with some even calling it “religious freedom’s Magna Carta.” Beyond praise, there’s the lack of criticism. IRF advocates frequently attacked Obama for not doing enough on international religious freedom. They pushed back on his first ambassador, claiming she was inexperienced. They also frequently complained about Obama’s apparent lack of commitment to this issue in conversations I had when I ran the Pew Research Center’s work on international religious freedom. But this criticism all faded away when Trump came to power. This positive response to the Trump Administration is puzzling. Despite promises, aid has been slow to arrive to Christians in Iraq. And, as I argued in this report for the Center for American Progress, even if it does arrive, favoring Christians at the expense of Muslims may exacerbate tensions there. Additionally, Trump has been…strangely…silent on religious persecution in Russia, which includes Jehovah’s Witnesses and other groups. And then there are Trump’s immigration policies, which have hurt persecuted Christians trying to escape to America and demonized Muslims. These are all clear instances of the Trump Administration downplaying or actively undermining religious freedom around the world. Continued support for Trump among IRF advocates thus risks turning this issue into a partisan one, undermining future advocacy efforts. My concerns have been theoretical so far, but now there is a very concrete issue arising from Uighur advocacy. One element of China’s restrictions on Uighurs is the detention of Uighurs who frequently interact with individuals from a list of predominantly Muslim countries. This has led to the detention of many Uighur women married to Pakistani men. I assume US pressure on China will include calls to end this policy. But how will that work when the United States bans travel from a set of countries that are (with two exceptions) predominantly Muslim? Sure, we’re not detaining their relatives but the policies are similar enough that China could argue America is being hypocritical. And the international community may be unwilling to back our efforts for similar reasons. IRF advocates who press China without criticizing the Muslim ban will similarly be seen as hypocritical, and serving US interests. So I hope the IRF community will finally realize the harm they are doing by embracing Trump. I’ve tried highlighting inconsistencies in several areas, and even started a running list of things they should be speaking out about on Medium (which I abandoned as it got too long). But here is a case where a very specific US advocacy effort will most likely be undermined by the Trump Administration’s broader approach to religious issues. Will this be what it takes for IRF advocates to finally push back on Trump? Of course, the unspoken context are domestic “religious freedom” debates. The Trump Administration may not consistently support international religious freedom, but it has whole-heartedly adopted the conservative framing of religious freedom on issues like abortion, women’s healthcare and LGBTQ rights. And as we all know, the Obama Administration argued that religious beliefs did not provide a license to discriminate. So maybe religious freedom advocates are prioritizing these domestic culture war debates, which explains their support for Trump. Maybe all my efforts to highlight the damage this is doing to international advocacy are wasted as a result. That would be disappointing.